**SALE - This same exact otoscope with Lighted Ear CURETTES is now less expensive on Amazon for a limited time. These can be used to aid in ear wax removal in adults** An inexpensive yet very functional otoscope for home use! LED module with a durable lightweight all metal body and switch. A proprietary process of lens manufacturing was used for a crystal clear lens with zero distortion. Designed by a an ER physician who's goal was to design an inexpensive otoscope that would be as functional in detecting eardrum abnormalities as the $400 models used at hospitals. 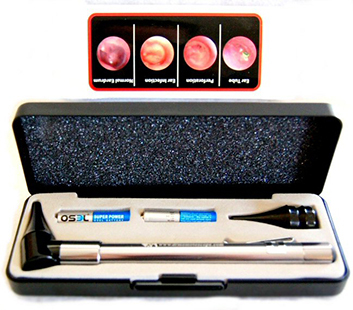 Each otoscope comes with a web-page link that has high resolution color photos of normal and diseased eardrums as well as instructions written by an ER physician describing how to properly use your otoscope for best viewing results. It explains the important information you need to know when using an otoscope to do ear exams.